Chemical Calculations (CM 4b, 2 hrs., 3 ECTS-Credits). (3) Before successful completion of the Studies Induction and Orientation Period courses amounting to 16.5 ECTS-Credits may be passed. The registration requirements listed in the curriculum must be met. 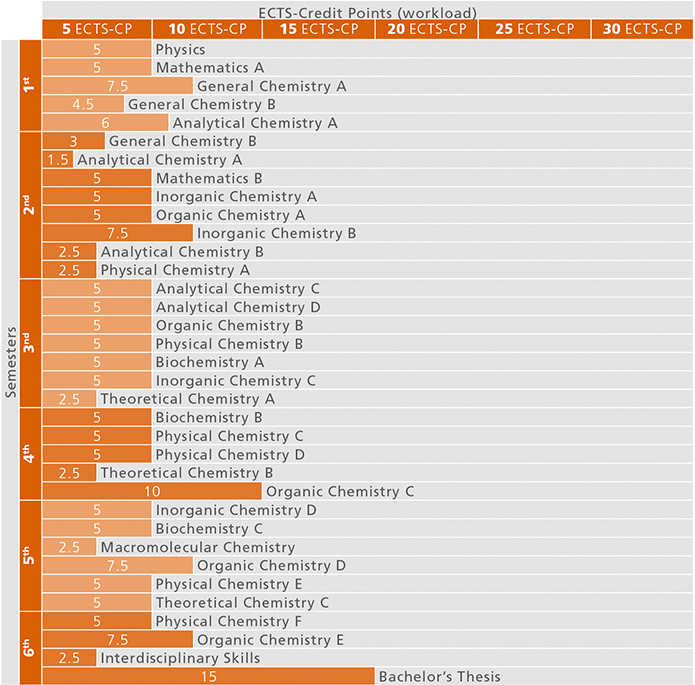 The Bachelor's Programme Chemistry is grouped among the natural sciences. The goal of the Bachelor's Programme Chemistry is to provide vocational training for chemists. The programme conveys basic subject-specific expertise, skills and methods of scientific writing and research, independent thinking and professional responsibility. The Bachelor's Programme Chemistry is the basis for the Master's Programme Chemistry or related master's programmes. The Bachelor's Programme Chemistry is designed to comply with international standards by closely linking theoretical knowledge and practical subject-specific skills. In addition to subject-specific expertise in the sub-disciplines of chemistry, the bachelor's programme also includes interdisciplinary key competencies (soft skills) in team worki, oral and written communication, interdisciplinary problem-solving, time and project management and a sense of responsibility in regard to the benefits and risks of scientific research and applications. Graduates are able to address, evaluate and implement scientific developments in the fields of chemistry and to apply them in interdisciplinary contexts. They possess theoretical and methodological problem-solving skills as well as multidisciplinary skills/key skills, such as the ability to work in a team and oral and written communication skills. The Bachelor's Programme Chemistry prepares students for activities in research, technology, industry, environment and chemistry-related areas of public authorities.